LEONARDTOWN, Md. 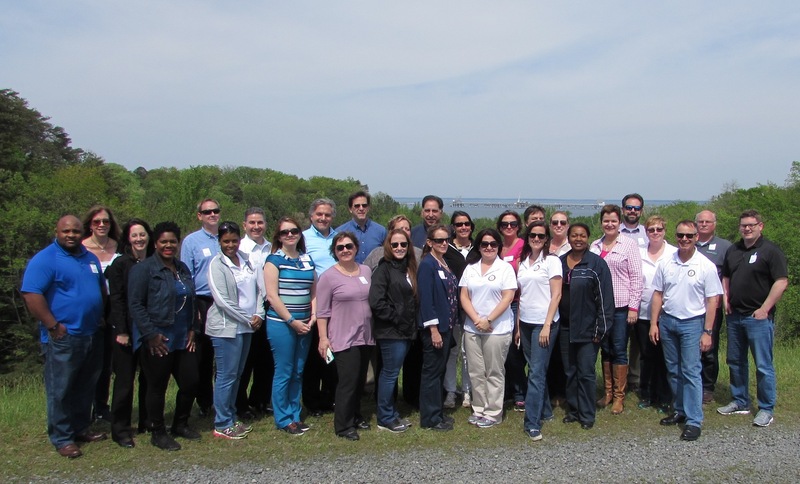 – June 23, 2017 – On April 27 & 28, 2017, the Leadership Southern Maryland (LSM) Class 2017 participated in the last of nine educational programs for the 2016-17 LSM class – Energy and Environment. The two-day event began at the Calvert Marine Museum where Linda Vassallo, economic director for Calvert County, provided information and data supporting the impacts on Calvert County. As the first part of the two-day curriculum, LSM class participants had the unique privilege of an experiential presentation on the environmental impacts on our waterways highlighting the challenge of the crab and oyster population by Captain Jack Russell, owner of Fins+Claws, and Richard Dodds, curator of Maritime History at the Calvert Marine Museum’s Lore Oyster House. The participants were bussed to Exelon’s Calvert Cliffs Nuclear Power Plant where Janna Jackson, communications manager, and Anne Lindner, director of state government affairs, provided the rare opportunity of a walking tour of the facility. For the afternoon session, the class toured Dominion Energy’s Cove Point LNG Terminal, where Danny Woods, director, LNG Operations, Joe Gardner, manager, LNG Operations, and Karl R. Neddenien, media relations and community relations manager, briefed participants on Dominion’s transition to exportation of liquefied natural gas. Dominion hosted lunch with an educational briefing followed by a windshield tour of the facility under construction and a walking tour of the pier to show the off-shore exportation pier and the ongoing shore restoration and maintenance project as well as their new emergency operations center in the Patuxent Park. The participants finalized their day with a “behind the scenes” tour of the Calvert Marine Museum by Doug Alves, LSM’13. The second day was emceed by manager of the Front Porch, Jeff Lewis. Lewis shared his passion and educational information on local agricultural and environment challenges within the region as well as the economic challenges of a locally owned business. The day began with a visit to the Loveville Produce Auction allowing the participants to experience “commerce in action” while observing interaction of the Mennonite and Amish agricultural community with local restaurateurs, grocers, and individuals who purchased from their harvests. Lewis helped class understand the process of buying through the auction and how impactful this market is to Southern Maryland. The participants then traveled to Hughesville, where they were given a tour of the SMECO Solar Farm by Kenneth Capps, senior vice president of engineering and operations and chief operating officer, and Thomas Dennison, director of government and public affairs. Following the tour, Austin J. Slater, chief executive officer, along with Dennison, and Natalie Cotton LSM’11, director of community and public affairs, hosted the participants at the SMECO Engineering and Operations Center, where they had a tour of the facility, highlighting its environmentally friendly construction, including the Operations Center and educational brief on SMECO. The group finalized the afternoon with a Buy Local panel discussion. The guest speakers were Shelby Watson-Hampton, executive director of the Southern Maryland Agricultural Development Commission and owner of Robin Hill Farm and Vineyards, Chip Bowling, president of the National Corn Growers Association and helps operate the family-owned Bunker Hill Farm, and Paul Kellam, a commercial waterman and owner of Kellam’s Seafood. The class interacted with staff at each site, including program advocate, Joe “Mort” Mortensen, LSM’16 and Natalie Cotton, LSM’11, and as leaders living in the Chesapeake Bay area they had the opportunity to discuss the impact to the economy, environment, wildlife, natural resources and future generations while understanding the commitment each one of these organizations visited has towards our community. Overall, the class participants were thrilled to be part of Leadership Southern Maryland and the Energy and Environment Program.